I'm not a Planner - Options? Assignments are the tasks that you give your student to complete: math lessons, spelling tests, writing assignments, science experiments, field trips, etc. You can enter Assignments in advance or add details after the fact. You can enter each and every task attempted and completed by your student, or just a representative assignment for a week, month or term worth of work. All of your hours, grading and skills reports will be generated from the information you enter as Assignments. The only required fields for any Assignment are Student, Subject/Course, and Date. You can add additional information as needed. By default, the following fields are disabled: Assignment Location, Complete by Student, Custom, Links, Notes, Order, Sessions, Skills, Supplies, and Topic. You can enable any or all of these fields, or disable additional fields, in Program Options: Optional Fields. 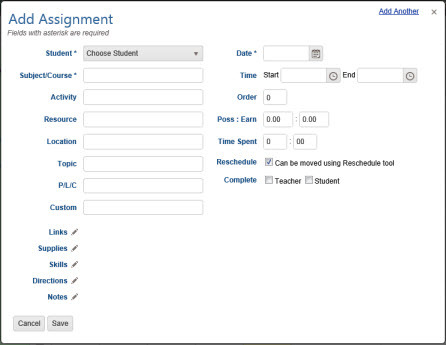 Assignments can be created directly in the Agenda or by submitting Lesson Plan items using the Scheduler tool. HSTOnline will help you keep track of Assignments which are Past Due - those which have been assigned to a date prior to today and have not yet been marked as completed. Students can view the items which they have not marked as Student-Complete; Teachers/Administrators can view items which they have not marked as Teacher-Complete. Assignments can be Rescheduled forward or backward in time as needed. Add multiple Assignments for one or more students on one date or over a range of dates. Mark Assignments as Complete to generate Grades, Auto-Attendance, Time Spent/Sessions, etc. Below is a list of all the possible fields for any Assignment you create. Again, the only required fields are Student, Subject/Course, and Date. You may enter any additional details you want or need for your homeschooling records. You can enter these details on Assignment creation, or you can go back and add additional information after the fact using the Edit features. I'm not a Planner - Can this work for me? Use HSTOnline in the way that works best for you and your homeschool. You can plan work out in advance, you can document every single assignment your student completes, or you can choose to enter work after the fact, or only enter representative assignments of her work throughout the year. To generate an entry in a Report Card or Transcript, you only need to enter a single Assignment per Subject/Course per Term that has been graded and marked as completed. In fact, you can simply create placeholder assignments for your Student for the entire year for each subject area and you or your Student can fill in details of what was actually done on that day as you go along. To do this, use the Add: Assignment - Multiple option from the Agenda - Calendar View or Agenda - List View to create your items. Set your Day Off entries first, so you can skip over those days. Then, set up the skeleton assignments for each day of school. See Tips for Unschoolers for step by step instructions. Grading is optional in HSTOnline. If you do not wish to use the grading features, you can disable this feature in the Program Options menu. When Grading is enabled, you can grade every Assignment or selected Assignments. To generate an entry on a Report Card or Transcript you need to create a minimum of one completed, graded Assignment for each Subject or Subject/Course for each term. Directions for creating minimal entries for these reports can be found in the Report Card or Transcript Help Pages. Grades can be reviewed and edited in the Student - Grading Overview page and printed in a Report Card and/or Transcript. HSTOnline allows you to choose how grades are to be calculated for your students, using either the traditional Averages method, or by dividing the total points earned by the total points possible. You must choose one method for all students. You may change your selection at any time. Make your selection in the Program Options: Grading menu. The options are outlined below with examples demonstrating how the different options may affect your student's overall grades. The Student - Grading Overview will show exactly how each Term grade was calculated using the grading method you selected. In addition to selecting the calculation method, you can also choose how percentage grades will be rounded: to a whole number (0); to one decimal place (0.0); or to two decimal places (0.00). You can create a printed list of Assignments for any date range using the Daily Task List report. The report can include any combination of Appointments, Assignments and/or Chores. You can export a list of Assignments - and other entries in the Agenda - List View for any date range to a .CSV file using the Option: Export menu.